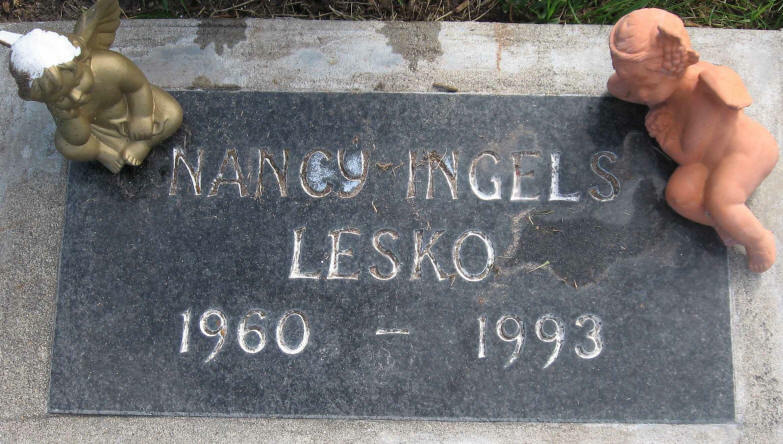 Nancy Ingels Lesko of Seaside died yesterday on her 33rd birthday, a day after she suffered a stroke while running in the Big Sur International Marathon. Lesko's death was the first among runners in the eight-year history of the Big Sur marathon, event officials said yesterday. The Prunedale School second-grade teacher was 23 miles into the 26-mile marathon Sunday when "she started to feel dizzy" and dropped out of the race, according to a county coroner's spokesman. Lesko's husband, Brad, who was running in the race ahead of his wife, said Lesko was forced out of the race by leg cramps and didn't complain of dizziness until later at a medical station. After finishing the race, he went searching for his cal station. After "finishing the race, he went searching for his wife and discovered her in the medical tent. Marathon officials transported Lesko to a first-aid station where an intravenous solution was administered before she was taken to Community Hospital of the Monterey Peninsula. Lesko was declared dead of a brain hemorrhage yesterday at 9 a.m., the coroner's office said. "What should have been a day of joy for her family and friends has become an event of unbearable grief," said race director Bill Burleigh, who said that marathon officials were "stunned" by Lesko's death. "We're all feeling it," said marathon spokeswoman Joan Miller. "Running was her life,'' Brad Lesko said of his wife. Lesko's father, Howard Ingels of Seaside, said that his daughter had been a serious runner "ever since she was about 20 years old." Even though the Big Sur race was Lesko's first marathon, her husband said that "we had participated in all the local 10K events for years, and we had done a number, of half-marathons and stuff." Friends said that Lesko had a minor heart problem but had received clearance from her physician to participate in the marathon. "She had. some (health) concerns, but the doctor thought, from what I gather, that she (properly) planned and prepared herself," Lesko's father said. Brad Lesko, an engineer with the Slautterback Corp., saicT that he and his wife had trained rigorously for the Big "Sur race. "We had done 20-milers over Jacks Peak, so we were ready. This (her death from a stroke) was just some fluke," he said. But the couple took time out from their training to celebrate their birthdays, actually five days apart, with a family party last week, Brad Lesko said. The couple, who had been married six years, met while Lesko was a student at Notre Dame High School in Salinas and Brad Lesko was attending Palma High. After finishing high school and working for awhile, Lesko decided she wanted to be a teacher. She graduated from California Polytechnic University at San Luis Obispo with a degree in industrial technology and obtained a teaching credential, her husband said. After working as a substitute teacher for the North Monterey County Unified School District, she became a full-time teacher at Prunedale School four years ago. She was a kindergarten teacher for three years and was teaching a second-grade class at the time of her death. The tragedy of Lesko's death was compounded at Prunedale School Sunday night when an apartment fire killed a pregnant mother and her four children one of whom was a student at Prunedale. Another had been a student at the school the previous year. In addition to running. Lesko was "really into animals," her husband said. She kept two "mutts" as pets — dogs named Buster and Mac and was taking lessons to learn to ride a painted horse she owned, her husband said. Lesko was also a volunteer at the AguajitoVeterinary Hospital in Monterey, and with the Monterey County Society for the Prevention of cruelty to Animals and the local chapter of CHAPS, an organization that saves horses from slaughter, according to her husband. She was also active in the animal rights organization, People for the Ethnical Treatment of Animals.